For installing doors on your post frame or steel building in Iowa/Illinois, overhead doors are a popular option. 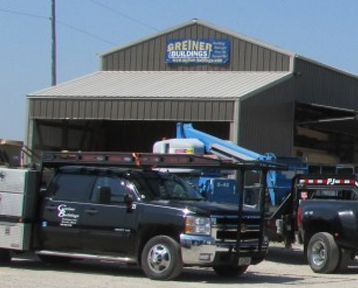 Greiner Buildings can install overhead doors on both insulated and non-insulated applications for residential or commercial buildings. We have a wide variety of looks and textures available. Overhead doors are commonly opened and shut using electric motors which can be operated by remote control. Smaller doors can be operated manually. Windows can be added and color varieties are available. These doors offer many benefits including low maintenance, high value, and good sealing and insulation. Weather conditions typically do not impact the operation of the door. Maximum widths on overhead doors, depending on the model are approximately 32’, which would be considered a very large door. Overhead doors require approximately 2’ of headroom to operate which could be considered somewhat of a drawback. Hydraulic doors are becoming increasingly popular given the many benefits they provide, especially in large equipment applications for conditioned spaces. If you plan to insulate your building and own large equipment, a hydraulic door may be ideal for you. The exterior and interior metal used is the same as the remainder of the building. Also, we use the same insulation in the door as the main building wall, so you do not lose R-value in your door! These doors seal very tightly so they are great for insulated buildings such as shop buildings and commercial buildings. No additional headroom is required for the door to operate, so buildings do not have to be built taller in order to fit the door. For instance, an 18’ tall building can accommodate an 18’ tall door. The doors are ran with an electric motor which powers a hydraulic pump. They lift as one single unit. Remote controls can be utilized. Widths up to 60’ can be installed. The door itself will be more expensive than most other types, but the end result may be a better option for less money overall. Slide doors are common on cold storage machine sheds and equestrian buildings. Users get a large door for less money. They use a roller and track system. Greiner Buildings slide doors utilize a unique powder-coated framing system. Often, we use steel girts to provide a better, heavy-duty door that is straight so it slides with less friction. Slide doors can be single units or split units. 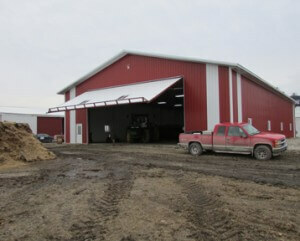 We have installed slide doors up to 40’ wide and 20’ tall. Bi-fold doors are similar to hydraulic doors in several ways, except they open by folding in the center—thus the term “bi-fold”. Bi-fold doors are typically less expensive than hydraulic doors, and are more common in non-insulated applications, such as airplane hangars. They utilize and electric motor that operate a cable or strap system. We have had bi-fold doors for nearly 15 years at our building plant and have had very few problems with them. So we declare they are a highly reliable, cost effective solution for buildings that need large width doors for a budget-friendly price. So for your no matter what type of post frame building you have, whether it be your hobby garage, machine shed, or other industrial buildings, we have a door for you. Call us to find out more on how our overhead, slider, or bi-fold doors can make your work easier. 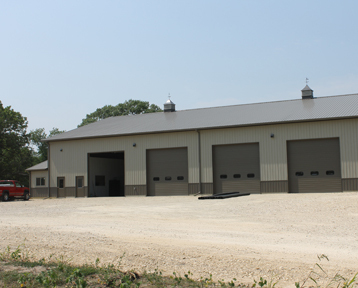 For your residential or commercial building construction Illinois or Iowa projects, we have the doors for you at Greiner Buildings! For design and installation call today!